Where is the space for my leather rock band? 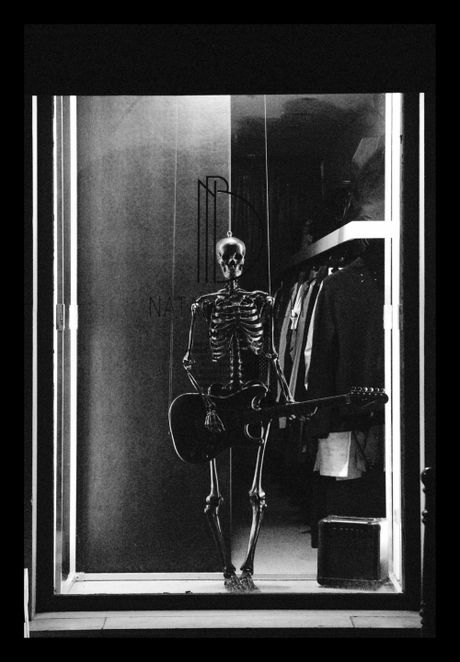 Every season Brilli goes all out covering an object expertly with black leather, last season it was a black leather skateboard but this season she has outdone herself and possibly the extent of her patience, as she covered three skeletons, a drumkit, a guitar, an amp and a mic with black lambskin leather. 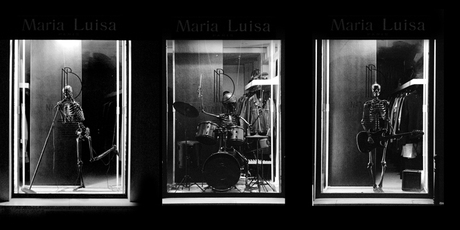 Natalia Brilli’s silent rock band took 500 hours of work just to do one skeleton and during Paris Fashion Week, it was playing a silent gig in the windows of Maria Luisa (where I should have snapped some pics at night…). It now goes onto Miami for Art Basel in December and will then go onto New York, Dusseldorf, Copenhagen, Vienna, Montreal, Hong Kong, Sydney and Singpoare (details here). 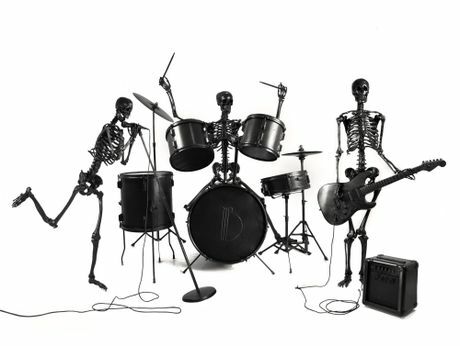 Every piece of the band is available for sale in their limited editions and if only I wasn’t cursed with the apartment the size of a cardboard box and a poorly bank account… oh what YouTube video fun I could have with a leather rock band, iTunes and too much time on my hands…. immaculate. can’t wait for them to be in new york. I would die for one of those!!!! I don’t buy art but i would invest in one of those!!!!!!!!!! Wow…if that isn’t love for a project and concept, I don’t know what is. That’s amazing. And that wallet is brilliant! Love the rock band. Just makes me cringe at.. how much leather there is. >< Poor animals. Okay, sorry for the PETA-esque comment. Alright call me a prude but I think this is kind of gross. And pointless. And kind of cool. But definitely gross. And funny. It’s definitely funny, when I look at the pictures again. Haha, that’s very funny but also sort of Beetlejuice-esque which is possible what makes it so funny. I would marry Natalia Brilli to get at her creations. I am just about to buy one of her leather bangle bracelets….unless I can put the credit card down and just walk away. WOW! That is just incredible. For some reason when I saw the first pic I pictured it being mini (like it could fit on a table) and I was super impressed at the intricacy of it. Then I read the post and realized it was full sized, and switched to being impressed at the scale and time consumption of it! Pretty amazing stuff, especially since she must be so busy already working on her collection…how did she find the time to do this!?!?! Again, wow! anyone got any idea where/when exactly this is comin to sydney, australia? 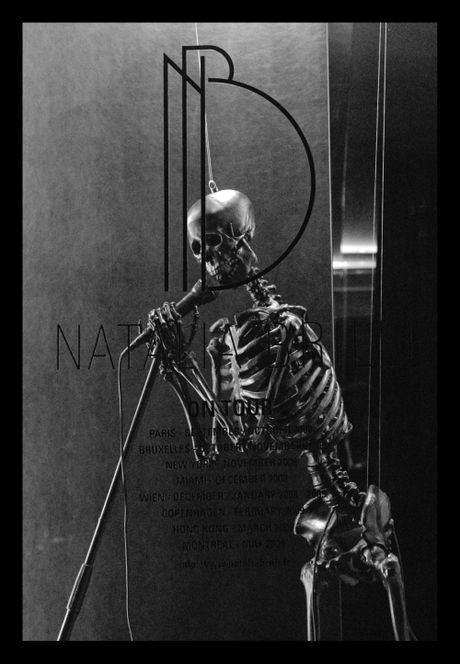 id seen the pictures, but i didnt know they were black leather skeletons!! wow! A rather morbid question but are these actual human skeletons or just science models? One thing that has always made me curious is how and were artist get there skeletons from(or in the case of Damien hirst just skulls). I know you can donate your body to science but can you also donate your body to art or fashion? funny, would anyone buy them? I agree, thanks for the great article!